As an endurance athlete, my eventual goal (and it may take a while) is to do a marathon in all 50 states. Since I’ve done a couple in Texas (my home state) I didn’t need another one, but that all changed a few years ago. Those of you who know me, know that I graduated from Texas A&M University in College Station. In 2014, my daughter started her college journey there. At some point I discovered that there is a marathon there and said I’d do it before Madison graduated. 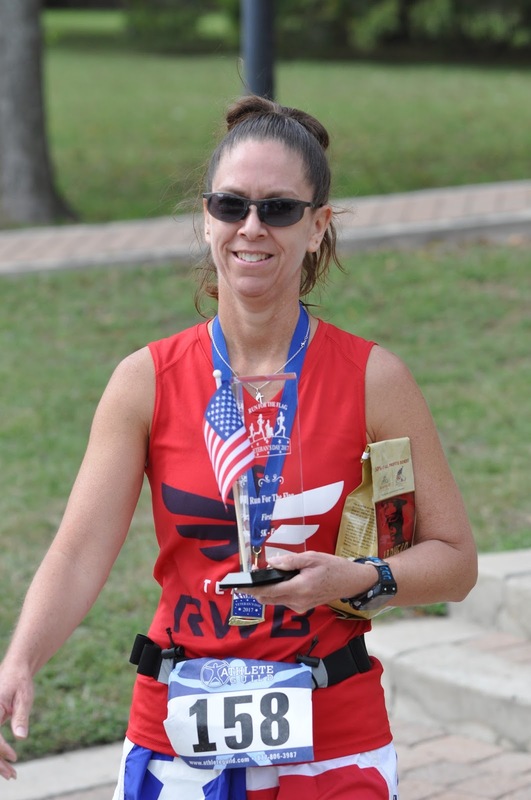 I had recently become self-employed before she went to college, so doing the 2014 race and spending money on race fees and a hotel was out of the question. I think 2015 was the year Kyle Field was being expanded and there was lots of construction on campus, causing the race course to be modified. I ruled that year out as well. In 2016, my daughter and her roommate decided they were going to do the half-marathon. I asked my daughter if she wanted me to do the race with her or if she wanted me to spectate. “Spectate” was her answer, so I didn’t sign up. 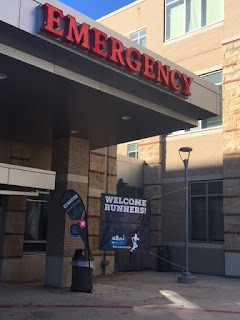 Turns out that come race day and probably less than a mile in, my daughter got sick and was done. No race finish for her. So, if I was going to do it while she was in school, this was the year. I signed up and convinced several of my friends to do the race as well. My daughter and her new boyfriend decided to give the half-marathon a go this year as well. Being a RRCA run coach, I know how to put together training plans. Once I registered, I got out the calendar and laid out a plan. I knew that I wouldn’t take an aggressive approach for this race – I wasn’t planning on trying to PR and I had several continuing education trainings scheduled for the fall that would make it hard to get in many longer runs. I started off following the plan well, but also struggled with some upper hamstring issues on my right side and some sacroiliac issues on my left side (no doubt, related). And then the fall arrived. In September and October, I had four weekends of training. Three weekends of pre-natal yoga teacher training that lasted all day and one weekend of Spartan Obstacle Specialist that lasted all day and meant traveling. I was also out of town some in August and September to move my son into his dorm at college and then again for Parent’s Weekend. Add a last minute trip in November to officiate at Ironman Arizona and, well, the long runs just didn’t happen. While I respect the distance and knew that I wouldn’t have a great race, I knew I could get through the miles, even if it took a long time. Saturday morning we headed to College Station. We had lunch when we arrived and then went to packet pick-up. As we arrived to the entrance of packet pick-up, I thought this was an interesting entrance. Little did I know how foretelling that would be. After packet pick-up we headed to Academy to get a few last minute items (like gloves for the new runners who hadn’t thought about things like that). That evening, a total of 10 of us met for our carb-loading dinner. We had a nice time and chatted about strategies for the race. At this point, I still didn’t know if I would do a run/walk combo from the start or just run for as long as I could and then start the run/walk combo. When we got back from dinner, I got sucked into Pitch Perfect for a little bit, but at 9:30 made myself go to bed. My daughter let us stay in her room and she and her boyfriend took the couches and air mattress. Let me also say that my daughter lives in a 4-bedroom house with 3 other roommates. Two rooms are upstairs and two are downstairs. My daughter’s room is downstairs, right by the front door and right by the wooden staircase. The house is not sound proof. One of her roommates is a vet tech at a veterinary clinic and was on call, so I knew she might be going in and out during the night. I knew a good night sleep was probably not possible. Little did I know. Around 1:30am, I woke up when I heard the front door open and close. I figured it was her roommate going into work. Then I heard some footsteps on the stairs and some noise for a while. I figured maybe another roommate had come home from a night out. A little while later, my daughter came in her room where we were sleeping and got something. Then I could tell the light in the living room had been turned on. I sent her a text message asking if everything was ok.
Well, it wasn’t. Her boyfriend was sick and not in a good way. I knew at that point he would not be racing. Around 3:00, my daughter came in to say they needed to go to the emergency room because he was getting dehydrated and cramping really bad. Our suspicion – food poisoning. My husband went with them while I tried to get another hour or so of sleep. It didn’t work. At 5am, I got up and got dressed. They were still at the emergency room, but arrived back home at 5:45. Just in time to take me to the race. At this point, my daughter decided she wouldn’t be racing either. If she did, she would have no sleep and wouldn’t be able to stay awake later to study for finals. When we got to the race site, I hit the port-o-potties and then rushed to find my friends. I found them just before the national anthem. As soon as that was over, I stripped off my extra layers and it was time to go. I still hadn’t decided my race philosophy. Oh well. As I started running, to told myself just to hold a nice easy pace and not push it. I felt pretty good. No pain in the hamstring, so I decided to just run as far as I could and see what happened. 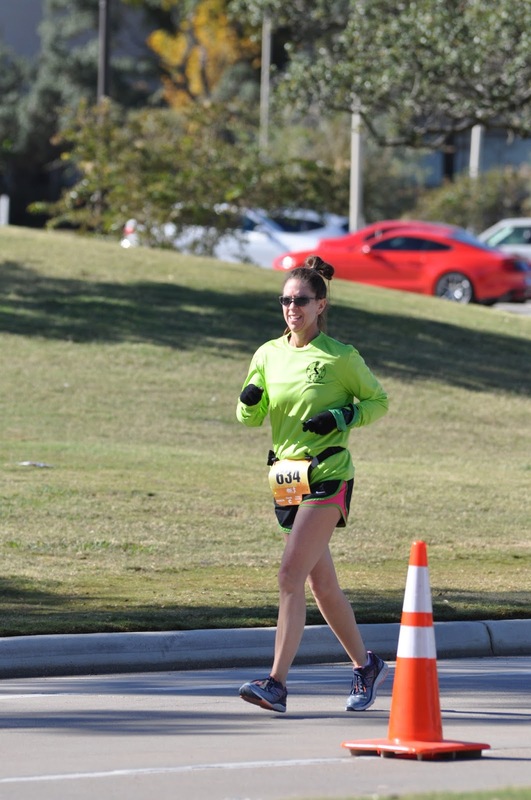 I was actually surprised at my pace when I hit mile 1 in 9:23 because I really felt like I was running slower. I just kept reminding myself to not get caught up in the crowd. Around mile 4 was where the half marathoners split off from the full. At this point I knew it would get a little lonely. The race only had about 3,000 runners and only about 1,000 were doing the full. I knew a lot of marathoners were already ahead of me and only hoped there were as many still behind me. At the race start it was in the high 30s. I had on shorts, but three layers on top. I knew I would heat up quickly and want to ditch one, so my family said they would try to catch me around mile 5 or 6. Since I was feeling ok, I wanted to keep running until I got to them at least. When I saw them, I started to strip off my top layer. I knew if I stopped to do it, I wouldn’t keep running. I didn’t want to stop. I chunked it to my daughter as I ran by. College Station is a pretty flat town, but we hit the first decent incline as we ran down Villa Maria and under Wellborn. I was able to keep running, which made me happy, as I’ve struggled with my breathing on “hills” lately. I think I managed to run 11 miles or so before I finally stopped for a walk break, and it was on another incline. I allowed myself to walk to the top and then started running again. At first, I just ran again for as long as I felt ok and then walked for no more than 1 minute. At some point, I started a 4/1 run/walk ratio. 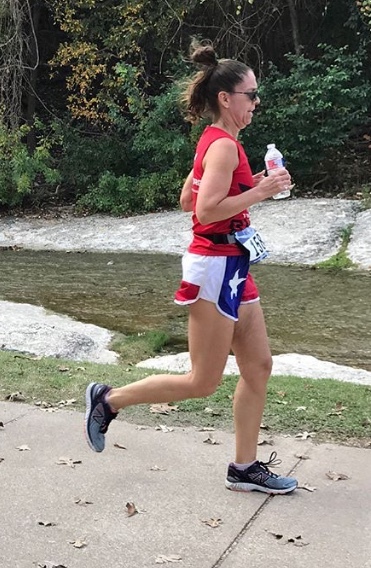 Somewhere between mile 15 and 16, I saw a friend of ours who is also a runner. She was there with her run group to cheer on some first time marathoners and she cheered me on as I went past. That helped a lot, so thanks Melissa! It was somewhere around here that the 4:15 pace group passed me. I started calculating if it was possible for me to still break 5 hours. My legs were starting to hurt and I knew I couldn’t keep up a fast pace. Not too long after that, the 4:30 pace group went past. At this point, we had gotten close to campus and I was running on parts of west campus that I’ve run on or ridden on during the Tri Aggieland. Running through Northgate just past mile 21, I ran past Santa Claus. Running through campus was fun and I knew I was getting closer to the finish line. 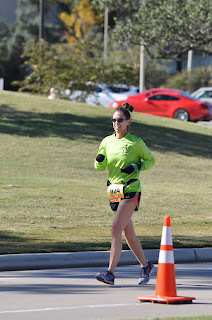 When the 5:00 pace group went past, I knew I didn’t have the “umph” to come in under 5:00. I wasn’t trying to PR, I didn’t need to prove anything to myself or anyone else, and I figured I’d enjoy the last of the race. As I got near mile 22, I saw Joel. At this point, I was doing more walking than running. I told him it would be another hour before I got to the finish and I decided from there that I would walk the last 4 miles. I did manage to smile and look good for the photographer just down the road from Joel. I was kind of glad I did I decided to walk. As I went past the quad, I got kind of emotional. My freshman year, I actually lived on the quad. The quad is the part of campus where the corps members live. My freshman year, they didn’t have enough corps members to fill up all of the dorms, so they opened one to female students and that’s where I lived. I absolutely loved living there and the friends I made my freshman year. Besides, the corps is such a large part of the Aggie tradition. From there, we headed toward the Albriton tower, yet another significant part of Texas A&M. I made sure to thank all of the police officers at every corner and to cheer for the runners who were still running and passed me toward the end. At one point, the officer told me “two more turns and you are there”. I was never so happy. As I turned the second corner, it was all down hill to the finish line. I thought about running, but decided to just walk it in. 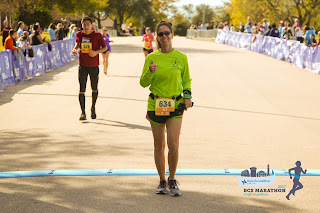 There was no point in running and I wanted to enjoy the finish (although I have to say the marathon finish toward the last runner is a heck of a lot different than the end of an Ironman finish waiting for the final finishers). This morning when my daughter still thought about racing, she put her jewelry on. I asked if she was planning on running in it. 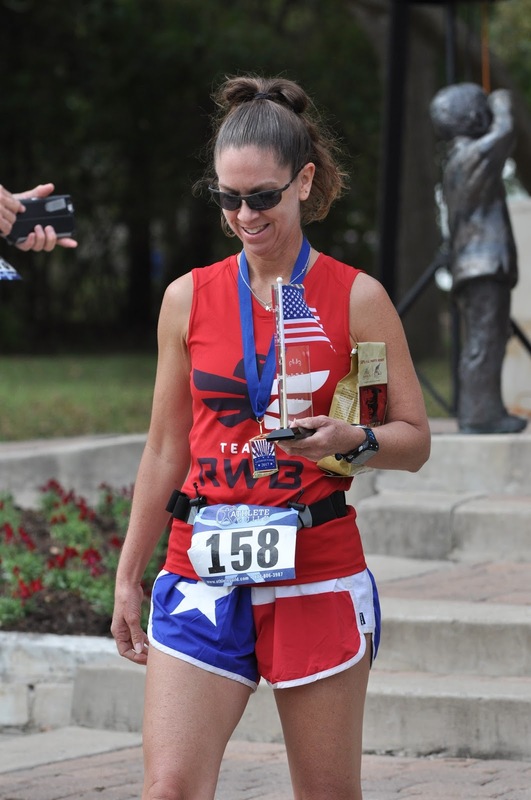 She said she was because she wanted a picture with her Aggie ring at the finish. I NEVER run with my rings, but decided she had a good idea. 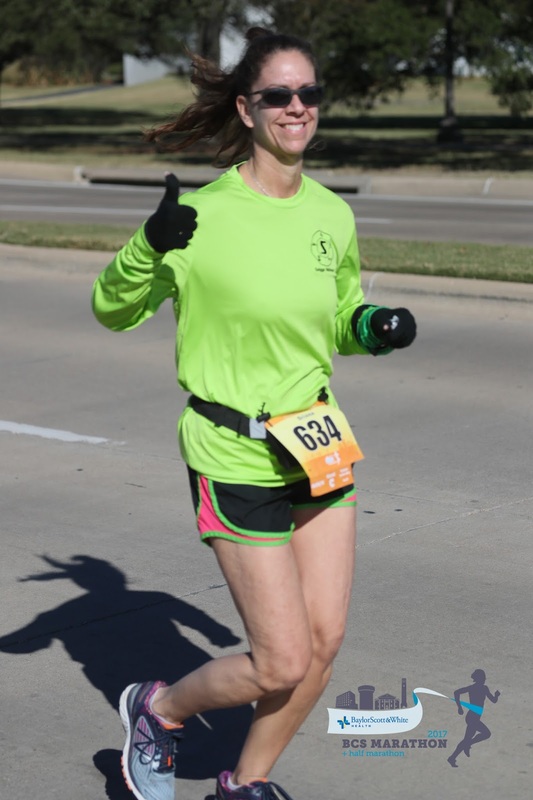 I wore gloves most of the race, so I didn’t worry about losing it and it was cold, so my fingers didn’t swell. 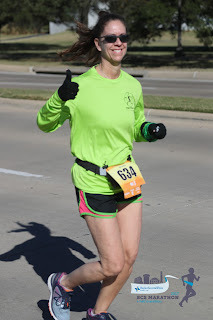 I had taken the gloves off a few miles out and as I crossed the finish line, I gave the photographer a big ‘ol Gig ‘Em!!!! 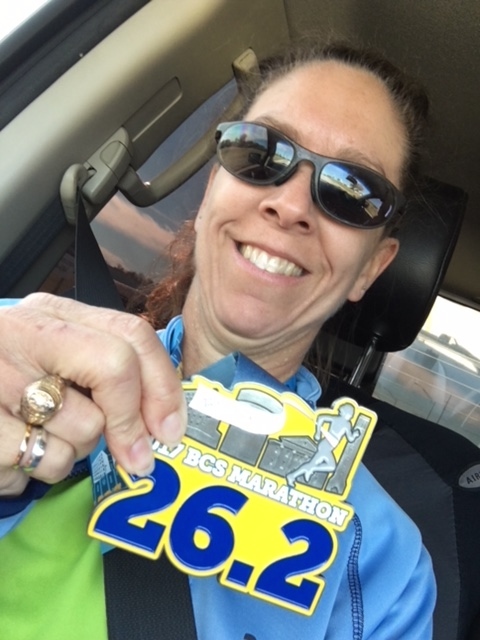 I got my medal and finisher jacket and we headed back to the house. 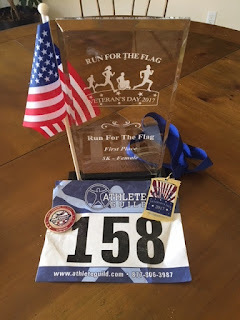 I’m glad I did the race, but I think for my daughter, it’s just not meant to be. 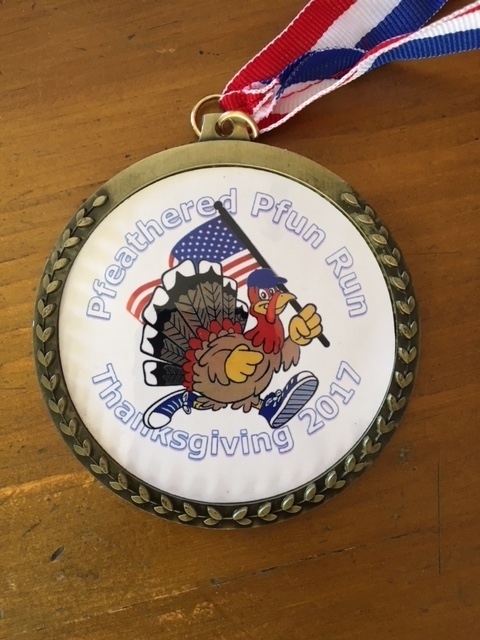 Several years ago, my same race director friend started a turkey trot in Pflugerville so that folks wouldn't have to drive downtown and spend half their day doing a turkey trot. 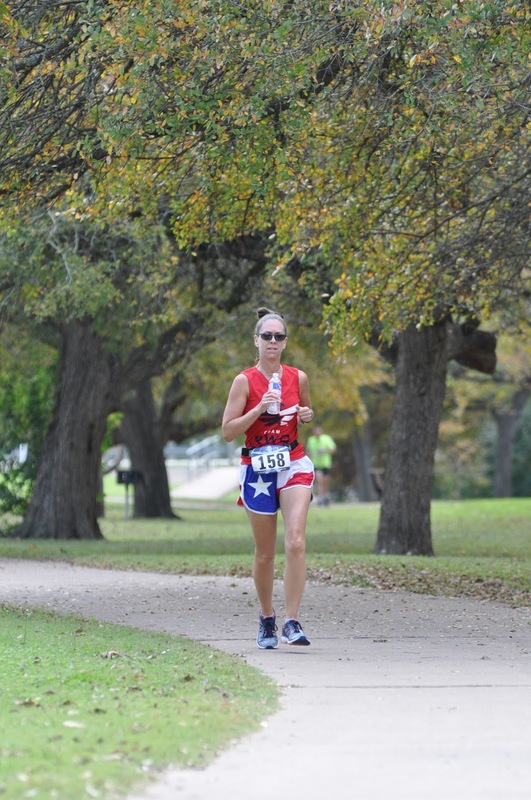 This way, those of us who live in Pflugerville can get up, have a fun race, and be done in time to get home and get those Thanksgiving feasts underway. I've done it every year since he started it, but this year decided I needed to do the 10K for this one. I needed to get some "longer" runs in before the marathon on 12/10. Thanksgiving morning turned out to be pretty cold for us. When I got to the lake, my weather app showed 38 degrees. I got my packet from him and headed back to the warm car to wait until race start. About 15 minutes before the start, I headed over to get ready. The 10k folks took off first. I had no goal on this one other than get the miles in. As we headed out from the start line, lots of people got ahead of me. I just kept reminding myself that I just needed the miles. I've been struggling to run straight through without walk breaks lately, so I just wanted to run as much as I could. As I came around the first loop (each loop is 3 miles) I could feel my right hamstring giving me issues and could feel it affecting my gait, but kept going. I had warmed up by now and shed a layer. 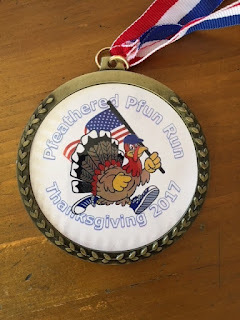 I was kind of wishing I had just done the 5k, but knew this would be good for me. Somehow, I managed to make it back around to the finish and was glad to be done. The course wasn't a true 10k, so my results show a time of 57:55, which I was happy with. 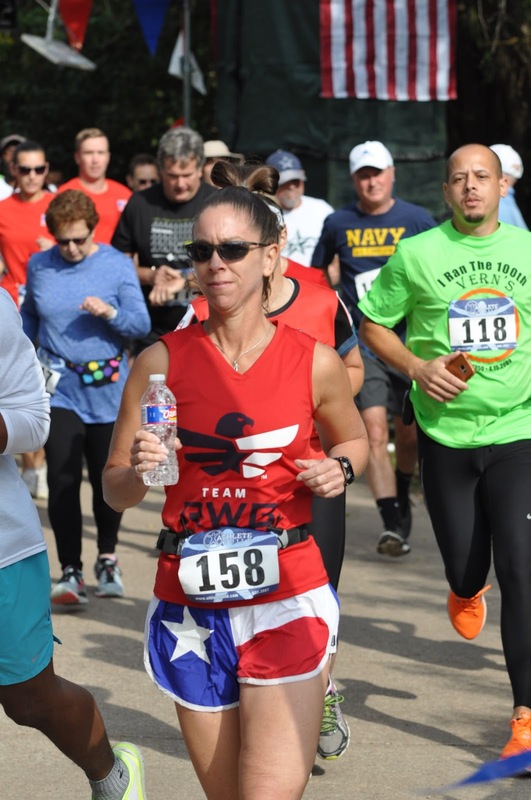 A friend of mine is a race director and had been asked to put on a 5k run on Veteran’s Day to honor the veterans. There was a 5k option and a 10k option. I emailed him a week ago to see how many people were registered. I had not registered yet and was trying to decide between the 5k and 10k, but my running has not been up to par lately and I didn’t want to be the last 10k finisher if I chose that option. He responded that more people were actually signed up for the 10k than the 5k. Since I knew I’d have to do a long training run on Sunday (I’m doing the BCS Marathon December 10th), I decided I should just do the 5k. As always happens on race day, my competitive nature kicks in. I wasn’t sure if I could place or not, but I thought I’d line up at the front and just see what happened. The man responsible for the idea for the race was up front with his daughter (probably about 7-8 years old). I was right up front with them. As the horn blew and we started, the little girl and her dad jumped ahead of me. 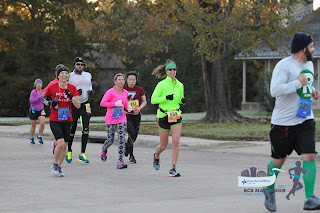 I saw another woman pass me as well, but knew that at that moment I was in third. My thought was to see if or how many other females passed me so I keep track of what place I was in. About ½ mile in, I saw the little girl slow, put her hands on her head and start to walk. As I got close to her, she turned around, saw me, and took off again. I knew I was going to have to work to pass her or her endurance was going to have to wear off. Eventually, the later occurred and I passed her. 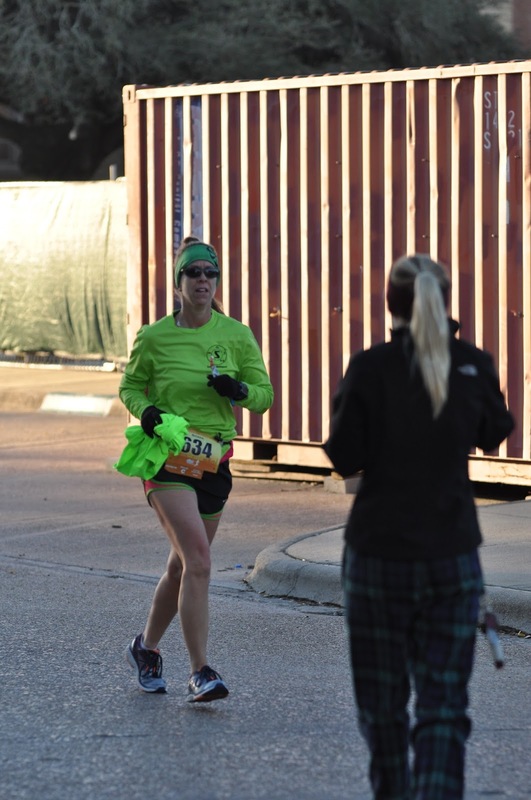 I saw who I thought was the other woman ahead of me a little ways up, but was unsure at the moment if she was a 5k runner or 10k runner. 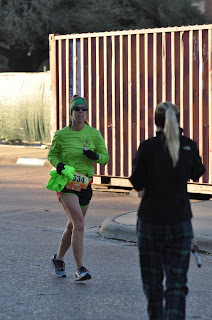 As we approached the half-way mark (it was an out and back course), I saw her turn around and knew. She was #1 and I was #2. As I turned, I saw two more women not far behind me. I knew I had to keep my pace up, but not push too hard. Slowly but surely, I caught the #1 female. I kept waiting for her to surge past me or for someone else to run past. I am very familiar with the trail we were running on, so I knew in my mind how much further I had to go and what I had in the tank. I still didn’t know how far behind me any of my competitors were, but I started to think that I could actually do it. That I might actually come in first. As I went under the last bridge and headed back to the park I tried to pick up my pace just a bit. And as I got closer to the finish line, I heard the announcer say “here comes the first female finisher”. 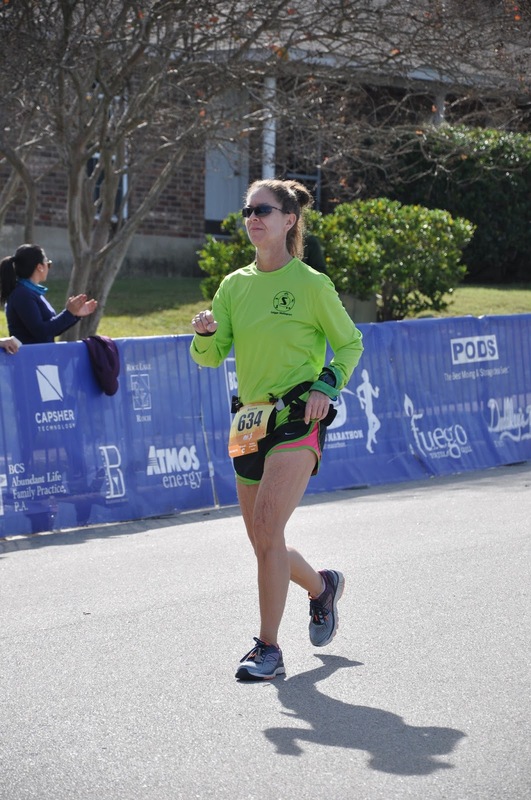 I knew I didn’t want to get passed in the last few yards so I started to run harder. I did it. I crossed as the first female in the 5k race. While it may not have been my fastest 5k and definitely wouldn’t have gotten me a podium at a bigger race, I was proud. And what a surreal feeling to be running and know that I was in first. Sometimes it’s all about who shows up on race day and today, I happened to be the fastest female that showed up to run the 5k. 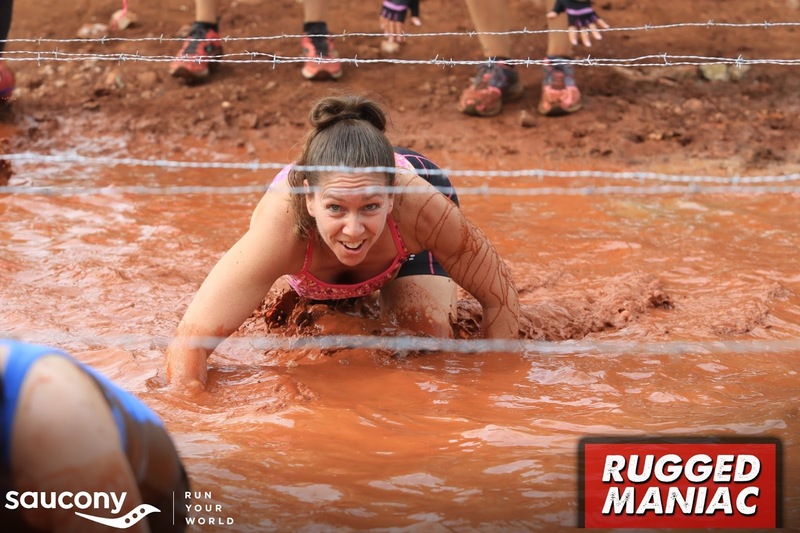 For the second year in a row, I signed up for the Rugged Maniac. My friend Jerri who also raced with me last year was back for year two, along with Nikki, a friend of hers. We had also convinced another boot camp attendee, Venae, to race with us, so there were four of us. Nikki had never done an obstacle course and Venae is scheduled for shoulder surgery in a few weeks, so we knew we wouldn’t be fast, but we assured them it was all about fun and no one would get left behind. 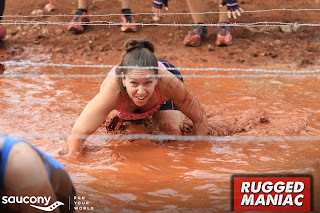 Last year’s weather wasn’t bad, but was a little on the chilly side, especially in the water/mud obstacles, but this year’s weather was perfect for me. I was able to wear shorts, long socks to protect my legs, and a sports bra tank top. At 10:30 our wave started and we were off. Jerri and I noticed right away that the trail we were running on seemed more dusty and less muddy than last year, so I wondered if we would get as muddy. The first obstacles we encountered were the Quad Burners and Trenches. You had to run up and over a “muddy” hill and then jump across the trench. Again, we noticed that the hills were bigger this year and there were definitely more of them. Already, we thought the course was a little more challenging. But we were having fun. Next up was the Barricades – climbing over a wall with a moving cylinder on top. Success for everyone. Climbing Jacob’s Ladder was also not a problem. But up next was one where I thought we might get wet for the first time – the Frog Hop. This is one that got me last year because I tried to be conservative on my approach. Last year I thought if I could jump to the middle of one pad, regain my balance and then jump to the next, I could make it. Wrong. When I jumped to the second one I slid in. Not this year. As I approached, the volunteer said “middle and fast”. So I went to one I the middle and I just ran across. I didn’t even really think about what I was doing and the next thing I knew, I was across. I had mad it. After climbing up a ladder to cross a bridge and climb a ladder back down we came upon Jump Start. This was basically crawling up and over a wall, but the bottom rungs had been taken away so that you had to use arm strength to initially get up. We figured it out and were on our way. As we came to Fenced In, it was the first real mud we encountered. It looked like everyone was going head first backside down and pulling themselves through, so that’s what we did. Backsides were officially muddy. It wouldn’t be long until the front side matched as the Commando Crawl was next. You always have to be careful in this one as hair or clothes can get caught in the barbed wire. Jerri’s hair did and some guy had to “unhook” her. We had a good laugh at that. Tipping Point was next and was definitely more challenging than last year. Last year it was one of the first, so the boards were not really slippery and you could just run or walk up and over. Being right after Commando Crawl this year, they were VERY slippery. Working slowly and together we got down and moved on. We climbed the cargo net at Let’s Cargo and then went through another mud pit at Head Scratcher. Then it was time to really get muddy and wet. As you Bang The Gong, the only place to land is in a pit of muddy water. Because of the warmer weather this year, it actually felt good. Then we went head first into Pipe Dream. Down the pipe into muddy water, under the barb wire, and up through the pipe to the other side. 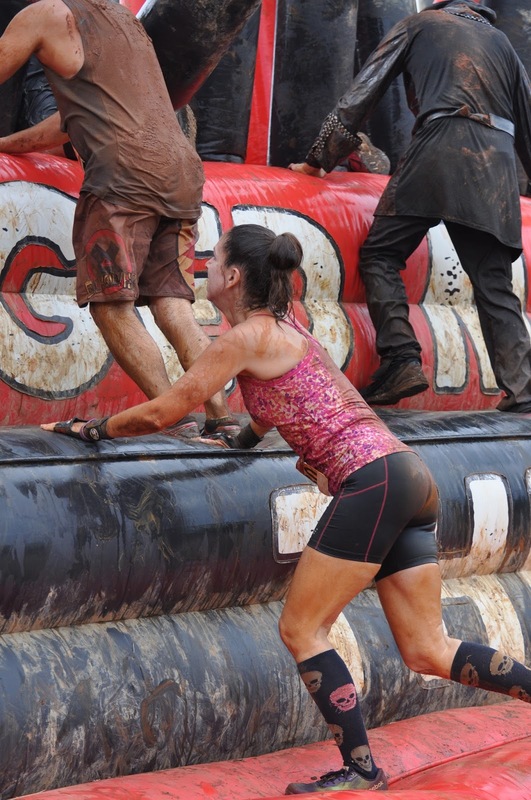 This one is trickier than it looks because you do have to use your strength to pull yourself up the pipe since you are wet and muddy. 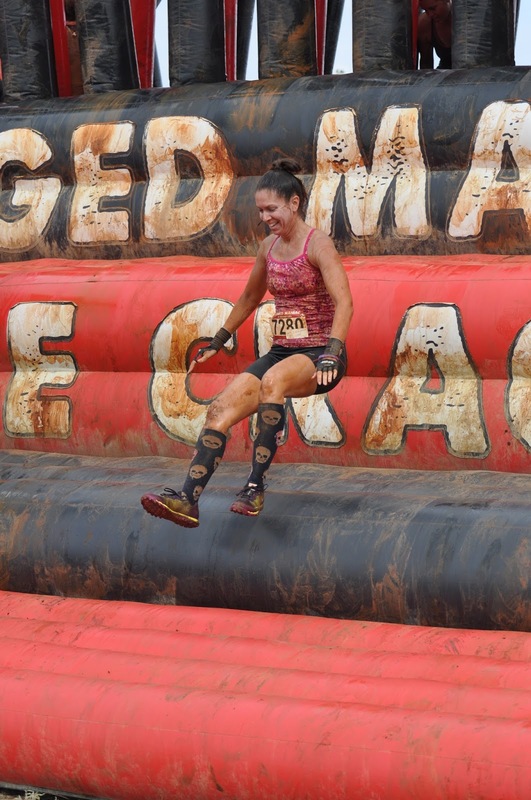 The next obstacle was a new one and I was excited about it because it’s similar to a Spartan obstacle, but with less weight. We had to pull a heavy chain (about 30-40 lbs) up off the ground several feet. Mission accomplished. Earlier in the race as we had been running between obstacles we had heard some loud pops. 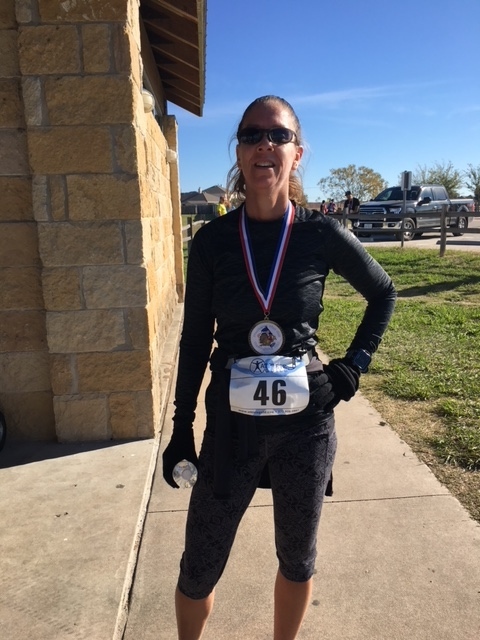 The race was held on a huge ranch, so we figured there might be a gun range close by or maybe some hunters (it is hunting season in Texas afterall). We thought it was a little weird it sounded so close, but we didn’t think they would put us in harms way, so we just went with it. Well, we soon realized where that noise had come from – The Guillotine. This was another new one. You had to lift a heavy board, crawl underneath it and then let it go. As you let it go, it made a loud pop. Pack Mule (carrying a heavy weight) and the ladder cross were no problem. The Gauntlet was next. This was one that I crossed last year, but almost got knocked in. Not this year. As with Frog Hop, I just ran and as I ran, I threw the heavy hanging cylinders out of my way. I was a little disappointed as we approached the Pyromaniac as there were no photographers anywhere in site. 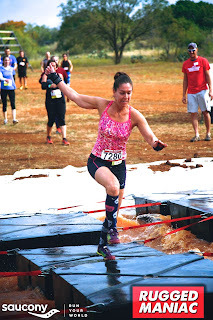 Jumping over fire is the classic picture everyone loves from these obstacle course races and I love my picture from last year (although it was Joel who took it and not the race photographers). Guess I wouldn’t get one this year. Through some more mud and then to the obstacle that I have yet to master – The Ringer. I’m working on it, but upper body strength in the pull-up position is still not where it needs to be for this. Add water and mud to the rings and, well, I just didn’t get far. The Crag was next and this one was a fun one. Think of bouncy houses. I have always loved those things and trampolines, so I jumped up one side, went over the top and bounced my way down. When I got to Antigravity, I knew I wanted to wait until my lane was clear to go since I was going to jump high. When the girl in front of me was at the top of the wall, I decided I would be ok and went. Well, when I went to take my final bounce on the trampoline to propel myself onto the wall, I realized she was still there and had to jump sideways. I almost landed on top of her. I think I freaked her out. Oops. 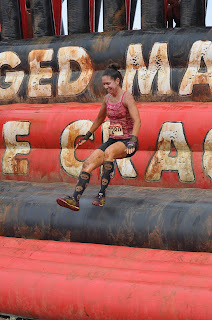 After that it was up the Warped Wall, across Mount Maniac and down the Accelerator to the finish line. As we lined up for the Warped Wall, I looked for the biggest guys to help me get up. I made eye contact and took off. I grabbed their hands, but am not really sure I needed them as I ran high enough up the wall that my foot planted on the top and over I went. One lady after me was able to grab their hands, but couldn’t get her feet up and over. She had to slide back down and try again. I was still waiting on the rest of my group, so when she tried again, I grabbed one of her legs and the three of us helped her get over. Loud cheers and claps erupted from the crowd. This is what I love about these kinds of races. Most people do it for fun and really encourage and help each other. When the rest of my group got up, we crossed the cargo net and got in line for the new, higher Accelerator. We made it where all four of us would go down together. Oh my gosh, what fun! We were all laughing at the bottom and then I was like, “Guys, we aren’t done. We still have to cross the finish.” We got out of the landing pit and headed toward the finish line. Once again, we had a blast and I’ll be doing this race again.